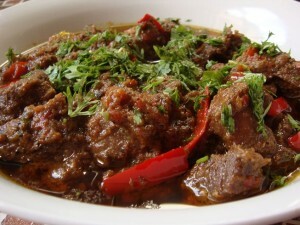 Karahi Gosht recipe by Hayat at PakiRecipes.com. Fresh green corriander and red chillies for garnishing. Wash beef and put in a pan. Put it on fire and let it boil in its own water. When water is evaporated put oil in it and fry meat when it turn brown add ginger /garlic paste and chopped green chillies. When green chillies are brownish add chopped tomatoes and let the water dries up on medium heat, till oil separates and your beef is ready. Garnish with fresh corriander and chillies. Serve hot with naan or roti. U can add some fresh thyme and parsley to it. In Mauritius it is called "rougaille"